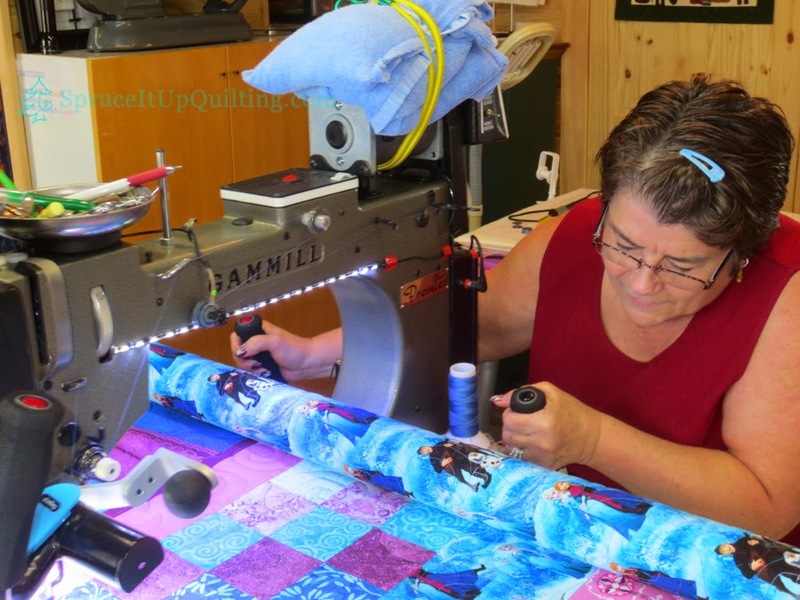 Spruce It Up Quilting: 2015 and Annabelle's quilt! Our 4 children and their spouses (except one) were home for the holidays. It was great to have them all under one roof again... it was a wonderful Christmas! They've all gone home now so yesterday was spent sprucing up the house and shop, getting it cleaned in time to ring in 2015! Now it's time to catch up on blogging! Time has slipped away and I'm late with a few posts! Sorry about that! 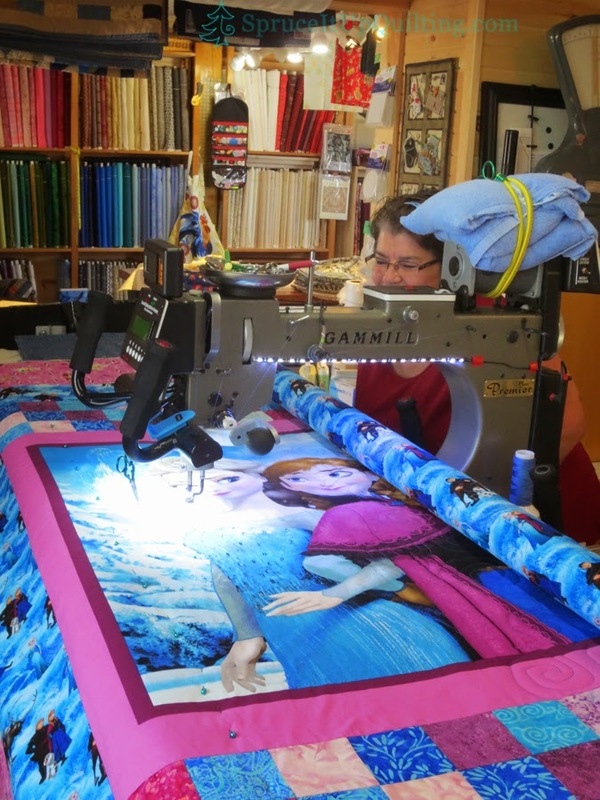 A while back, Marie was in to quilt a special quilt, one for her grand-daughter Annabelle's new big-girl bed. 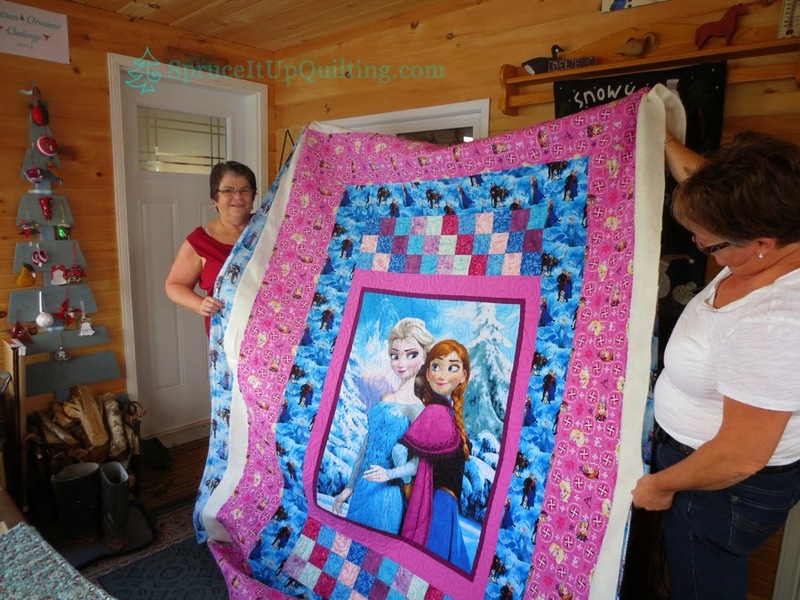 Frozen was the panel of choice and since her favorite color is blue, Marie chose King Tut #915 called Suez, a variegated thread of blues, purples and aqua. 80/20 batting made it soft and warm! 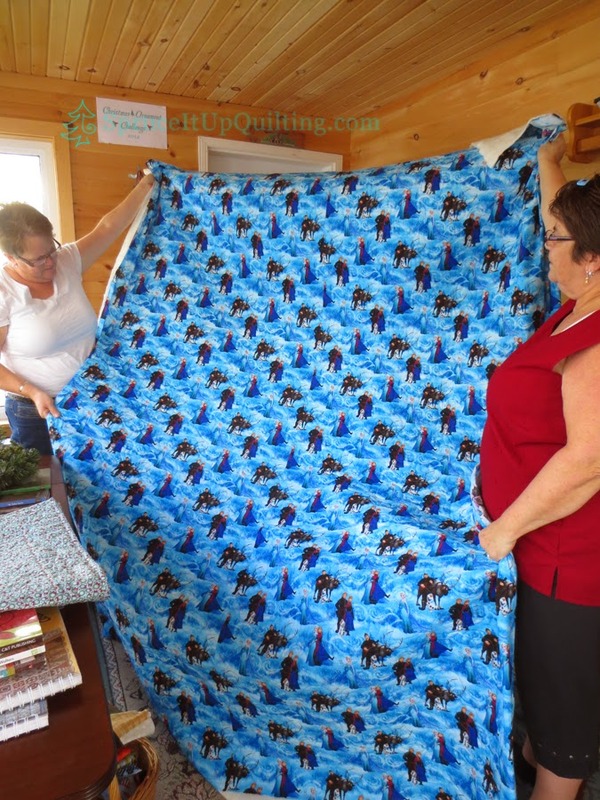 I was asked to keep this post secret until after the quilt was gifted. 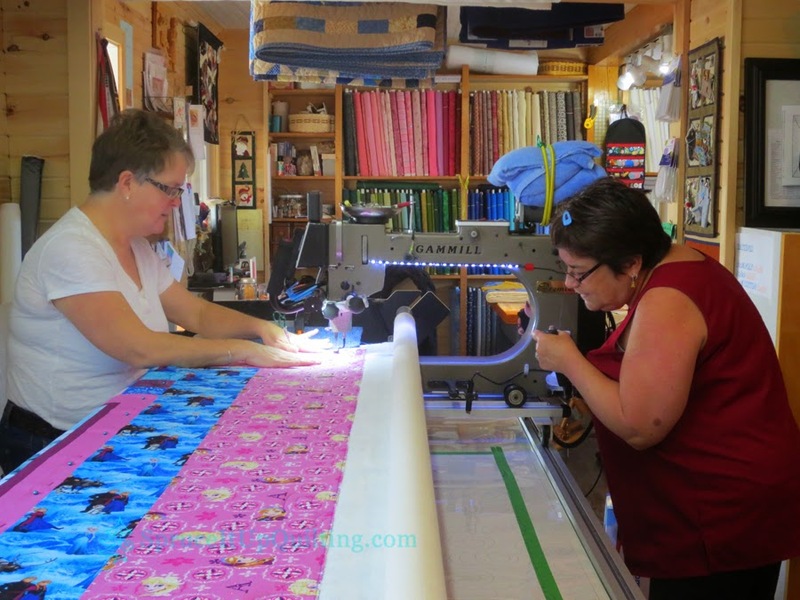 The pantograph Marie quilted is called Cotton Candy Vanilla Cream... Marie has since decided it wasn't her favorite pantograph. There will be a greater choice of designs in the near future! Lolah needs variety! 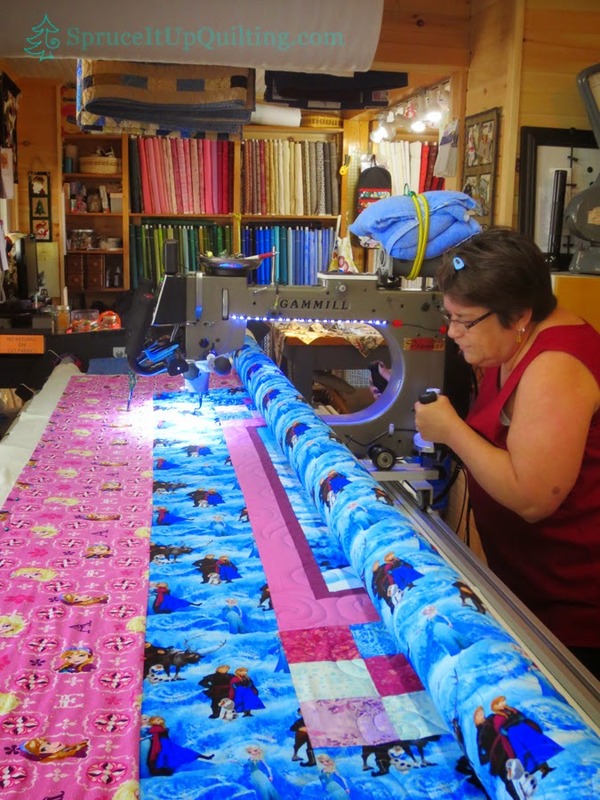 Marie takes great pride in piecing her quilts; she's a perfectionist! The quilt lays flat and square! I love how she made this beautiful panel larger. It was a fun day working with Marie! Anyone who knows Marie, knows that she is always warm. Sleeveless year round while I wear sweaters year round! So it was no surprise to have her change into capris and take off her shoes! 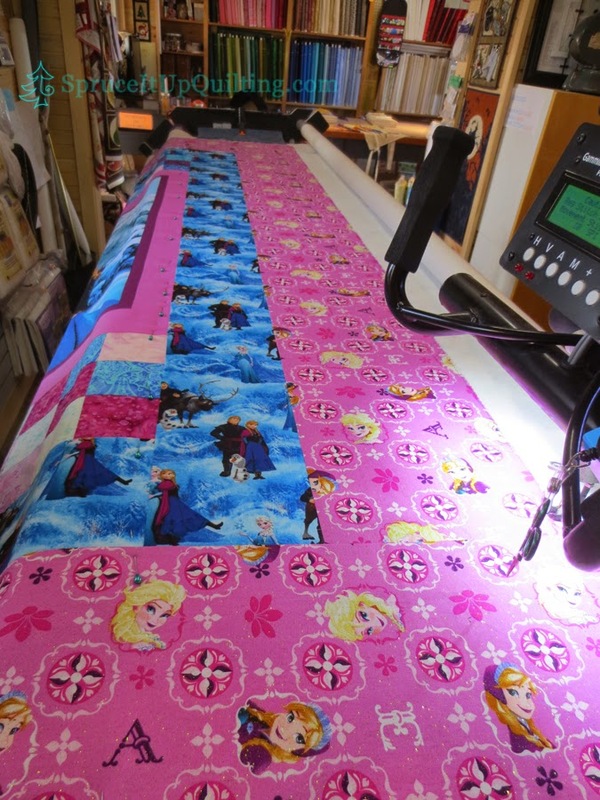 The border fabric is also the backing! Gorgeous! Well done Marie... Annabelle's quilt is beautiful! We hear Annabelle sleeps better cuddled under the new quilt grand-maman made! Happy New Year everyone... I wish you all a great year of health, happiness and lots of sewing time! Thank you for taking the time to read the blog, visit the shop and come in to show us your creations! We've enjoyed a wonderful start to Spruce It Up Quilt Shop and plan to continue to provide you with quality goods at affordable prices. Keep an eye on the Show and Tell page... some new photos will be added soon! Wonderful quilt! colors & fabrics are so perfect. Marie always has a great choice of fabrics & colors. TFS! You are so right! I love her fabrics and colors! This is a beautiful quilt.